Our first family Disney experience was in Paris when Son was four, we repeated it the very next year with a trip to Orlando but have not been back since. 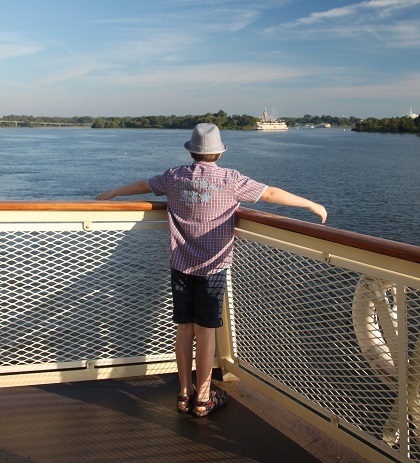 Some heavy lobbying from the youngest member of our family meant that when it came to his October two week half term the holiday decision was pretty much cut and dried – Orlando and Disney, a good dose of autumn sunshine and getting reacquainted with that Mouse was the general idea. Previous Orlando trips have seen us dash around like crazies, on the go from early in the morning until very late at night, desperate to cram in as much of everything as we possibly can and ending up exhausted in the process. 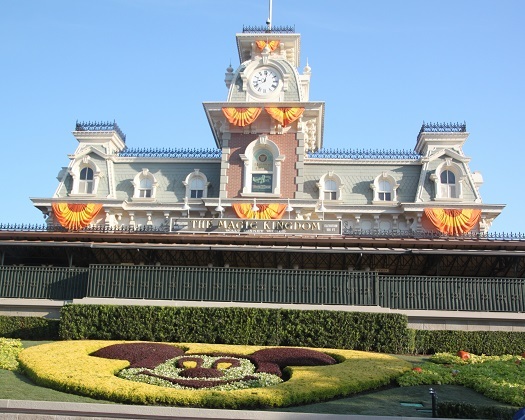 This time would be different, this time we vowed to choose just a couple of parks – the Magic Kingdom, Epcot and Blizzard Beach were the final picks, explore them fully and take it slowly which would (hopefully) end up in a more fun experience for all concerned. It was. 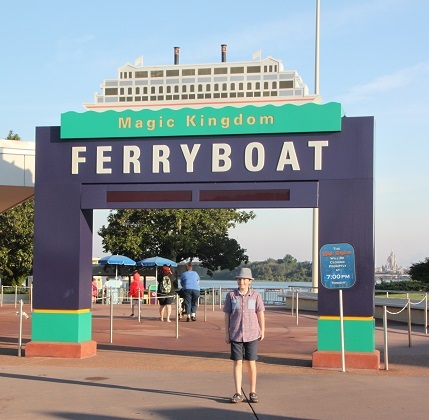 So a bit jet lagged and still acclimatizing to the fabulous Florida sunshine we took the ferry to the Magic Kingdom. On our previous visit here when Son was five we zipped through Main Street, keen to get started on other things. We never really paid too much attention to what is around here – not this time, we lingered and found plenty to see and do. A bit of a strange experience, you emerge from a tunnel under the railway line and find yourself in turn of the century, sterotypical small-town America. Lots of quaint buildings, plenty of red white and blue and people dressed in white trousers and stripey shirts selling massive bunches of balloons. All very nostalgic and heightened by the people dressed as typical townspeople from that era. Our first stop was the Town Square Theatre to sort out tickets and photo cards and get some respite from that sun. We decided to join a smallish line to meet Mickey the Magnificent, not sure what it was but curious to find out. About twenty minutes later we were face to face with Mickey, dressed as a magician he did a few tricks with Son, we took a few photos and were on our way. Son enjoyed his first meeting with the mouse, I think had I known what it would entail we would have given it a miss. Sorcerers of the Magic Kingdom was just over the street, this was something Son was very excited about. You receive a pack of spell cards, a key and a map and after some basic instructions are sent off in search of portals where you “cast spells” and battle with evil villains. Son loved this, took it all quite seriously and played a game most days we were in the park. We just tagged along behind but did find it a fun way to explore and some of the portals, in true Disney style were incredible. They have old fashioned vehicles which travel up and down Main Street. 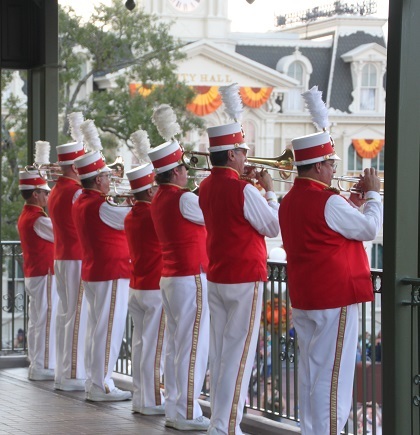 We hopped on board a horse-drawn trolley at the same time as the Dapper Dans – a barber shop quartet so were serenaded as we slowly made our way along the street. 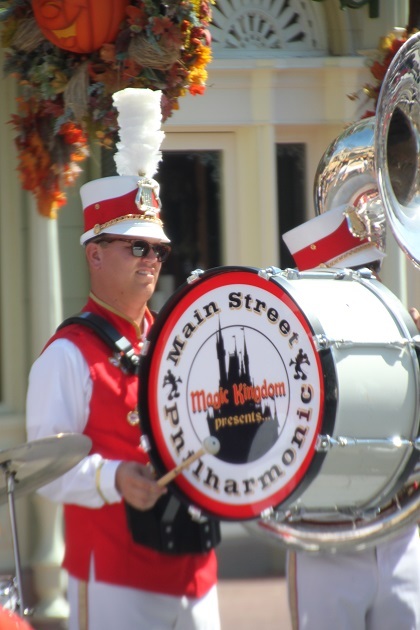 We watched the Main Street Philharmonic a few times too as they performed along Main Street – toe tapping music and enough cheesy jokes thrown in to keep Son’s attention. 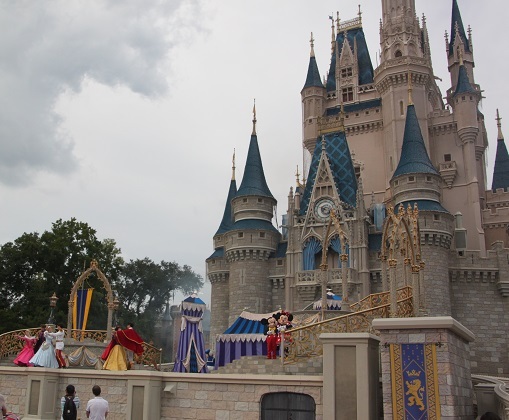 The Dream Along With Mickey Show – about 15 minutes long and in front of the Cinderella Castle involved lots of Disney characters, singing, dancing and fireworks. Son was not overly excited, nor was I. Maybe it was because we were drained by the sun, pick a cloudy day if you want to watch, there is not an inch of shade to be had and the sun is relentless. We browsed the shop windows and found Son, not normally one for retail therapy, was very keen on this pursuit here. 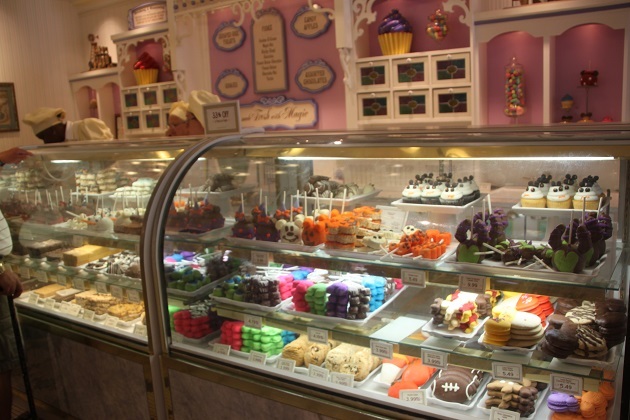 The Confectionary Store was our first port of call. Sweets and much deliciousness for sale here, our taste buds were definitely tingled. 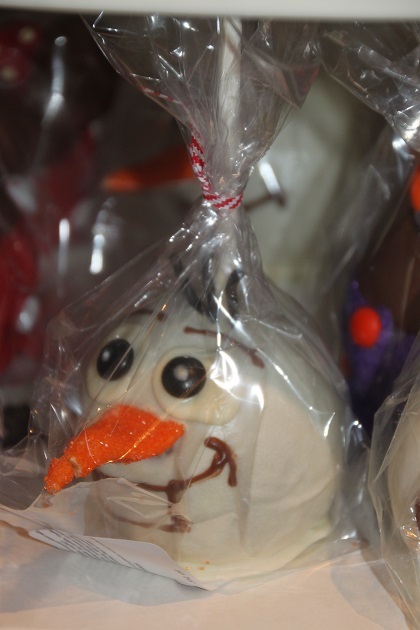 They have every type of candy and confection under the sun, the most enormous cookies I have ever seen and stunningly decorated toffee apples that looked far too good to eat. Best of all you can watch the candy makers in action. 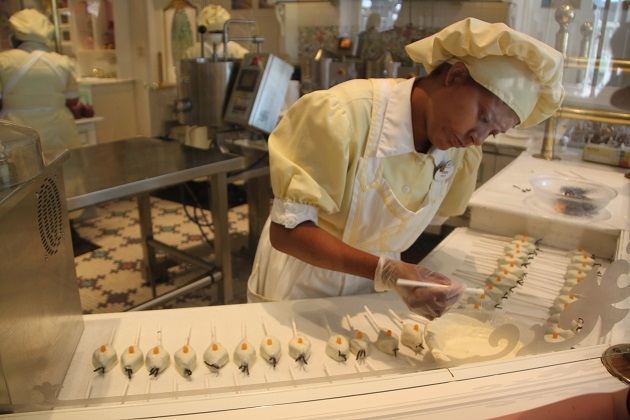 There is a glass wall where you can watch as they prepare all that mouth-watering stuff – I found this every bit as intriguing as the shows. 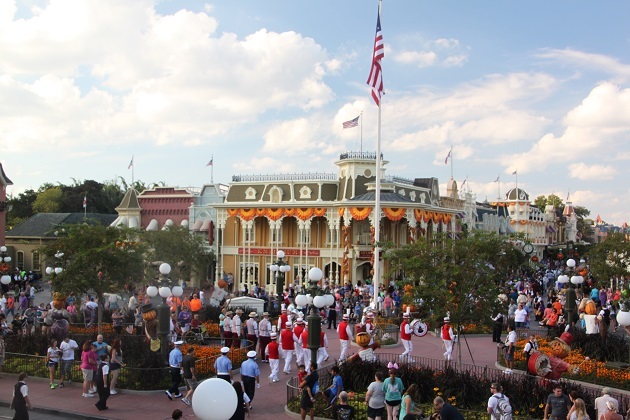 My highlight of Main Street was the flag lowering ceremony at the end of the day. This takes place every evening before sunset. The band plays some patriotic music, the National Anthem is sung and the flag is reverently lowered in a simple and moving ceremony. They fold it precisely and take it away in a little parade, often involving a veteran. Interesting fact – there are lots of flag poles in this area with flags flying, apparently only the main one involved in this ceremony is real. All the others have a star, stripe or something missing and are actually lightening conductors. 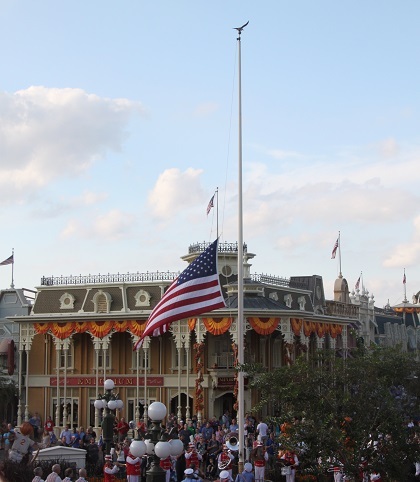 A moving little ceremony and a special way to end the day at the Magic Kingdom. Absolutely – it definitely still seems to be working well!! 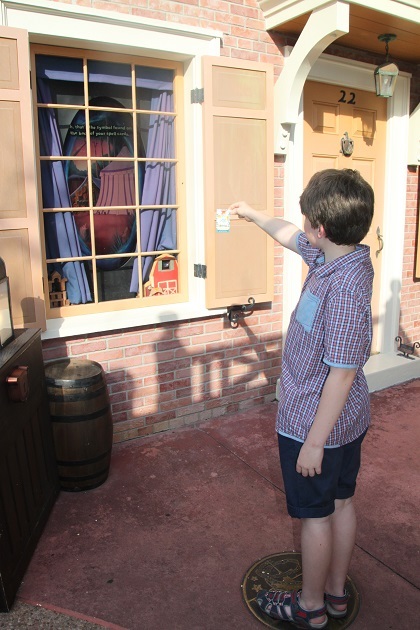 I think if they adjusted things people would not be happy – although there are subtle changes here and there, the spell cards and portal game we played throughout the park definitely is more modern and appeals to the tech savvie kids of today!! OMG, Joy! You have me dreaming. Been to both too! The first time in Orlando when my daughter was 3 and pregnant with my son. The second time when my son was almost three and my second son on the way. It was always so beautiful! Diving in into a different world. That’s exactly it Erika – it feels like you jump into a fantasy world, just wonderful. 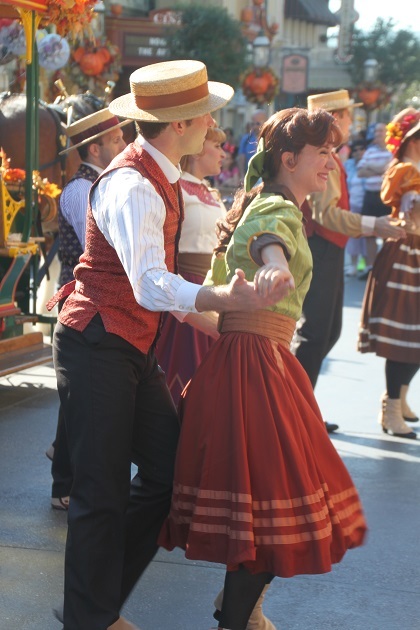 The magic just works everytime we walk down that street and into the park! We visited Disney World years and years ago. We also made the rookie error of queueing to meet Mickey. The fully grown adult woman in front of us was however barely able to contain her excitement at coming face to face the Mouse. She turned to us and gushed “Like wow, it’s going to be like meeting God or something”. She was being completely serious. It takes all sorts…. can’t quite work out adults though getting so over excited at meeting Mickey Mouse – a good story though!! Aren’t they great – how to choose though!! I’m not even sure how many times I’ve been to Disney World but it’s been about 4 years since the last trip. Your post made me nostalgic for a return visit. The best way to see it is definitely with kids. They bring the magic to life! That’s so true, we visited years ago before our son came along, it was fun but definitely much more magical with him in tow!! I think the secret is not to do too much – we’ve also learnt this the hard way, but with a 3 year old and a baby, well my head is spinning just thinking about that!! This time though it was easy, when they are a bit older it definitely helps – that and not trying to see everything and all parks! 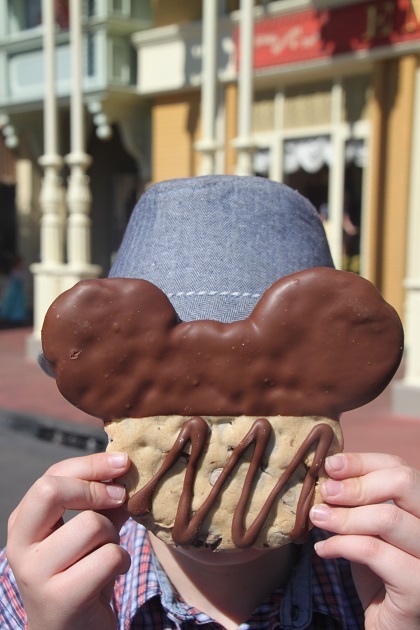 Giant Cookie Face is brilliant! Needless to say he had to share that!! It is a fun place to visit Suzanne for sure, but I think once in a while is enough for me, not sure I could cope with 2 or 3 times a year!! 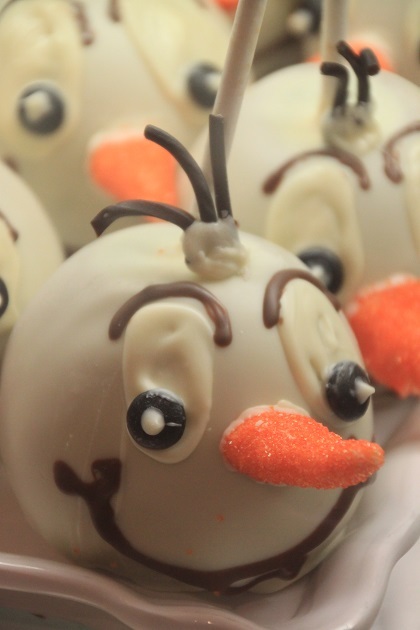 My husband does have a friend though who goes with his family every year as well so there are some people who seem to be hooked on Disney. We liked it but do like to see other things too! Orlando knocks spots off Paris that’s for sure! There’s no comparison – we went to the Paris park once for 2 days, it’s just not the same. I agree. I didn’t like it there, it had no Disney Spirit! Some of the staff were on strike (!) 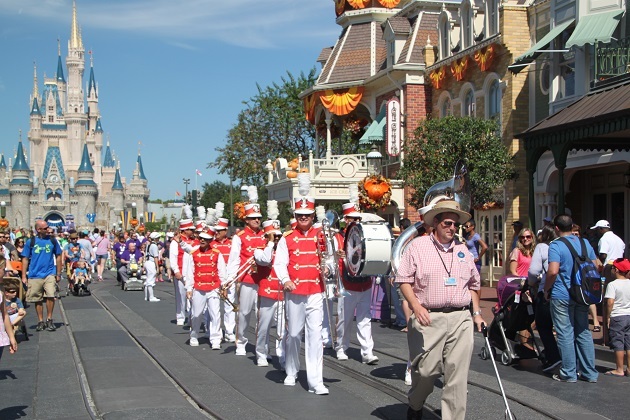 during our visit so all the parades were cancelled – definitely not the Disney spirit. 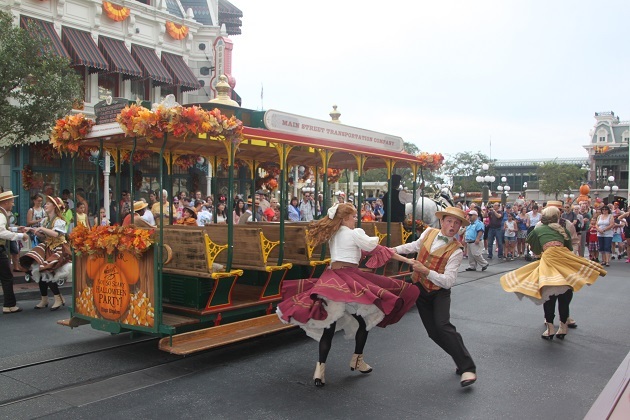 I thought the whole place lacked that Disney buzz and magic, we had sunshine and hot weather on our visit, imagine being there on a wet, miserable European summer day!! I had a not dissimilar experience. We waited for the parade and then someone strolled along and told us all that it was delayed by 45 minutes. I assumed that Mickey hadn’t quite finished his lunch! I would never go again. Thank you – it is a magical place for sure! It’s loads of fun, we had such a great time, hope you get to go soon! Very evocative pix. 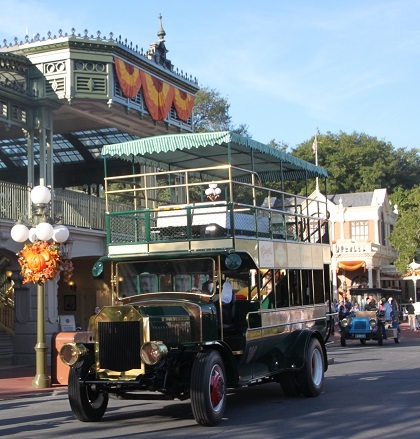 Did Magic Kingdom back in the 70s – in August, no less. Very glad I don’t need to do it again. 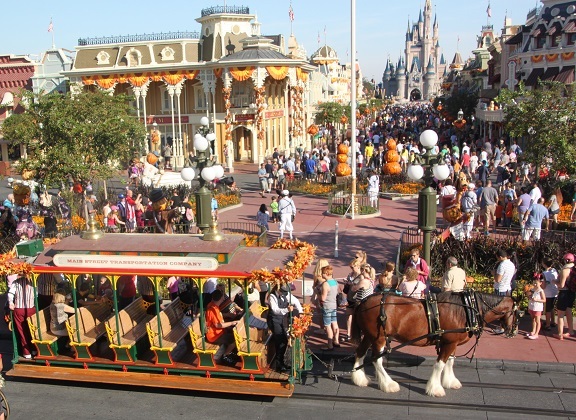 Although I did wind up staying in a Disney hotel on a business trip in the 90s (the committee got a cheap rate on the hotel rooms) and it was very disconcerting to head for the basement for a meetng in the same elevator as families heading for the rides. 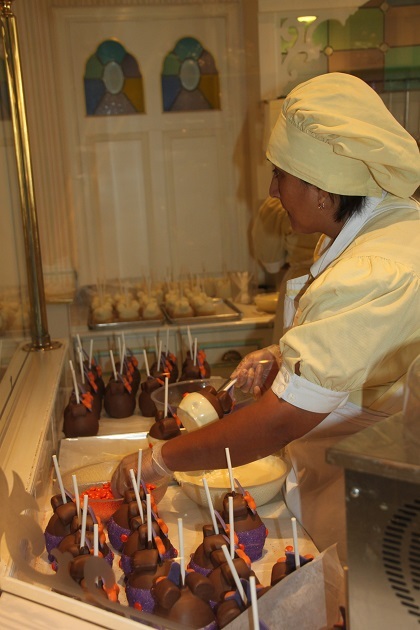 That must have been such a strange experience – having to work in the midst of all the Disney madness!! This looks like it was so much fun! I’m drooling over the desert photos! It was fantastic – and those desserts, well never quite seen anything like them – they tasted every bit as good as they looked!! 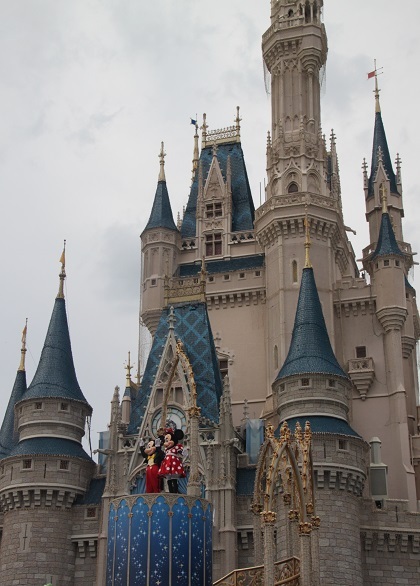 We were there just over a year ago and the kids really did find the Magic Kingdom to be magical. The thing I like about the Main Street section is the fact that it feels less stressful, less crowded and hassled, than much of the rest of the park. We enjoyed wandering around that area. 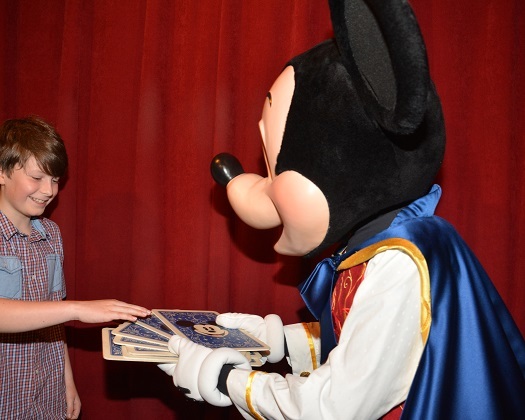 Meeting Mickey was a highlight for my boys too even though they know it is just a dude in a costume. That’s the magic of Disney I guess. 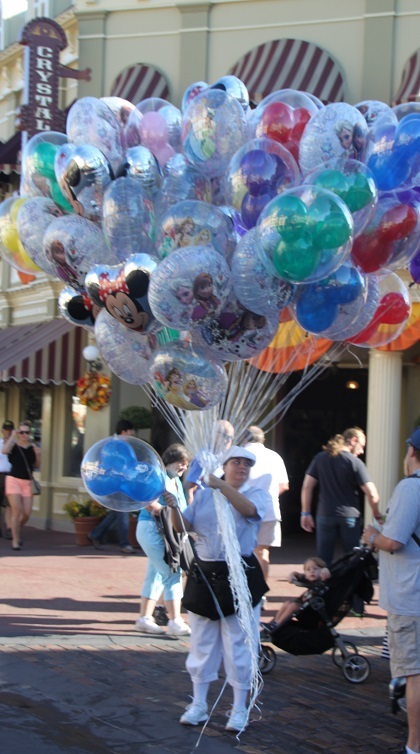 On previous visits we always tried to pack far too much in – never quite knowing if we would be back in Florida and Disney again. That meant we always rushed through this area and never took any of it in. I know just what you mean about it being less hassled and less crowded, that’s what I loved and there is actually quite a lot to see and do, glad we finally took the time to explore Main Street properly. Chuckling at the “dude in a costume” comment too Laura – isn’t it amazing what the Disney magic can do to us!! We will have to supplement hilly San Francisco walking with many many ice cream/pizza stops! The joy though (as you know and share so well!) is in the journey. We are just looking forward to being away, to seeing some family, and to finding adventure wherever it may be. Still pining for Europe too – so many places on my travel wish list! That is so true – he has (almost) overtaken me!! And then he’ll say: “don’t worry Mom, I’ll always protect you”. It’s sounds, and looks like fun day. I haven’t been to Disney World since the mid 80’s, but have been to Disneyland too many times to count since then. I’m looking forward to your posts on Epcot, and Blizzard Beach. I haven’t been to either place. I like to trade, and buy the pins. Has Son got into that? 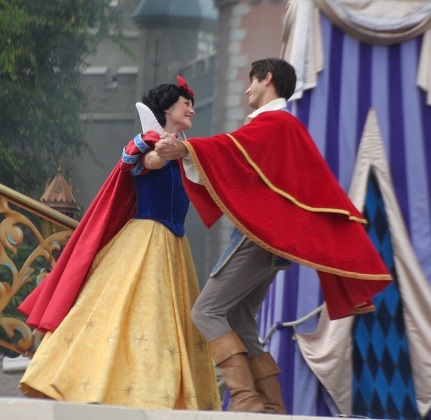 It was such a lot of fun – there’s just something about Disney! He did get a few pins but we’re very much novices with that – we’ll have to go back and trade/get some more! Warning! Pin trading can be addicting! I sometimes buy an extra pin just to trade. I don’t take my oldest and dearest pins with me. Lovely ! Didn’t seem too busy compared to the Paris one. It’s probably bigger and therefore, people must be less packed. Do they have special rides over there ? We went in October which I think is one of the least busy times, that definitely helps for a more fun day out! I think a lot of the rides are the same as Paris but it is a much bigger park. We went to the Paris park as an add on to 4 days in the city – that worked for me Rosemary as like you say, there are better things to do there!! Kids love Disney though, our son loved the Paris park and can’t get enough of Orlando. It is a lot bigger than Paris – and this is just one park – we did have a lovely time, it helps taking things at a leisurely pace!! That’s exactly what we did too Joy – both times we were on a 4 day trip to Paris so made the excursion out to Euro Disney from there. If this is only 1 park, I can imagine how huge Orlando Disney must be.. yes you’d have to pace yourself! A day in a fairy tail. 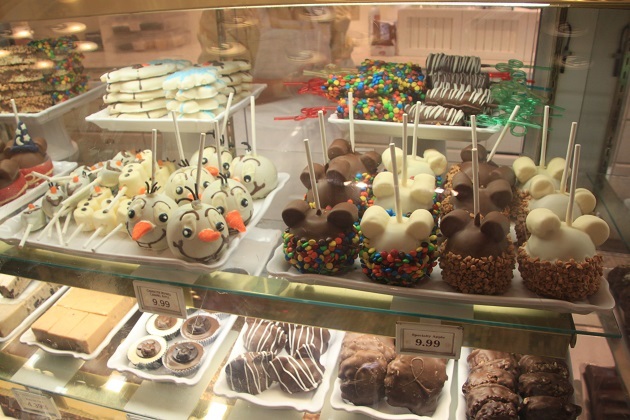 If ever in Orlando, we’ll have to go there! Highly recommended – it’s a wonderful day out! 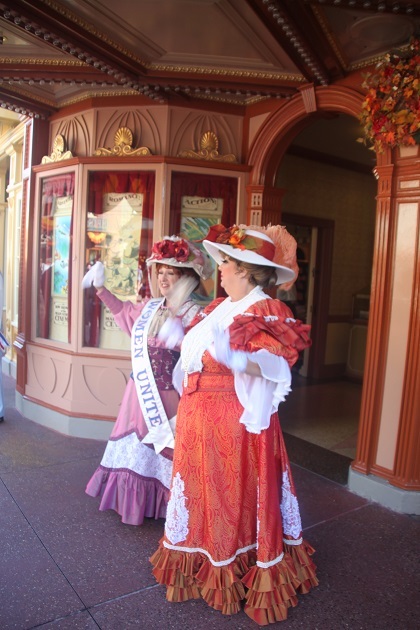 Isn’t it amazing how much there is to do on Main Street? So many people just blow right past it, running for the rides! 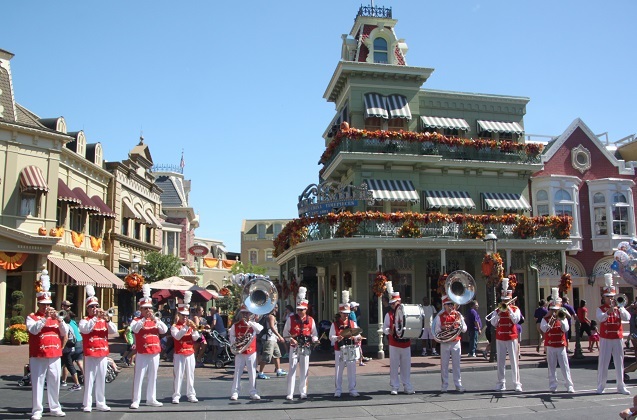 That was us before this trip and Main Street actually turned out to be a highlight for us! Joy, I am so glad that you all enjoyed your trip! I live 9 hours away and I have been once when we took our son at the age of five. We loved it and had a great time and offered to take him again, but we took up snow skiing in the Rockies and he was hooked by the age of seven! Disney does it right! At least you got to bring him when he was little Pam – I do think that is the most magical time. Skiing is a great alternative though, I can see why he would be hooked by that!! We used to ski but have never gotten around to bringing our son (yet) – just a bit tricky to get to the snow for us. You have a new chance at Disney in a few years with a new little granddaughter!! I haven’t been since I was eleven and I am desperate to take Monkey. I’ve toyed with the idea of Paris but it we’re going to do it then we might as well do it properly! I love how the parades are such a iconic ritual there although I don’t remember the lowering of the flags. I hadn’t seen the flag lowering before – we were too busy dashing about everywhere probably but it’s a great thing to watch. The parades are definitely second to none! Too many places to go and things to see, I get that completely – life is just too short to fit it all in!! It does – for adults and children it’s a superb place! !